Delicious and delicate green tea. Baby leaves and tiny buds create a very sweet green tea. Almost tastes like honey water or coconut water with notes of green vegetables. Yummy and fresh. Nice discovery I made recently. I recommend this tea! I was astonished by this tea. With a special aroma it tastes much better than Guapian I bought with 2 times price. I am going to stick to it in future. This is good quality green tea; however, it doesn´t stand out from other top green teas. Lovely floral orchid fragrance throughout. Has a mild chestnut taste and is very sweet, without any harsh notes. The dried leaves are beautiful and delicate, which I read is still usually skillfully processed and rolled by human hands instead of machines. 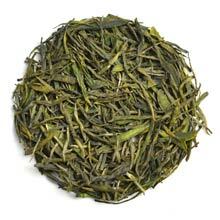 To me it is similar to Long Jing, but is less vegetal, and more on the sweet and floral side. The aftertaste is very unusual for a green tea-almost like a mint-like effect, which is very subtle. I also read this is rarely exported, so I am glad I was able to obtain some this year. Great work, TeasSpring! Highly Recommended! It dosen´t shock me. A nice green tea, but I´ve had better. good quality green tea. . This tea is not as good as I thought before. It tasted smoky. Excellent tea. The dried leaves are fragrant and fresh. The brew is light yellow-green and the aroma is floral. On tasting there is a little nutty grass and a lot of floral perfume. By the 3d infusion (2min) it is more like a flavorful white tea. Excellent and not the most expensive of the fine green teas here. Light and fresh taste, not especially floral though. It does indeed have a very refreshing aftertaste! A nice green tea, but I´ve had better. On a backgroud of chestnut and herbal aromas, more subtle hints of floral, citrus and mint aromas gently stand out, which make this tea so refreshing. Thank you for this excellent fresh tea! I love aroma, taste and aftertaste! Will buy again, after I´ll finish this pack! One month waiting for delivery, but grate result! Its my first order and now I know, that I can trust to TeaSpring. This is a good tea as long as you don´t over brew it. I used up most of the bag, not really liking it, because I was over brewing it. Once I got a tea ball, I liked it a great deal more. Would buy again. Sweet, delicate (don’t over-steep or use too hot of water! ), and fresh. This one tastes much better earlier in the year--the flavor really disappears, so if you want to get some, do it soon! Pure. Subtle. Fresh and refreshing. Hint of citrus soothes and relaxes. Tea to enjoy, when you are leisurely mind. A very good green tea. Has refreshing aroma but need slightly more leaves to get the taste. Gives a kind of citrus aftertaste which is very nice. Fresh and green. very light brew. not much flavor even if a lot of leaves used. good looking leaf, excellent for people who like light and ultra subtle flavors. Great--less pungent than other Mao Jians I’ve tried. Make sure to go high on the leaves to get plenty of flavor. Interesting flavor with noticeable herbaceous notes. Wonderful tea. Tasty herbaceous notes! i enjoyed this tea it was very refreshing. Excellent brew -- definitely good for multiple infusions, each with great taste. This tea is great. The scent of the leaves, both unbrewed and brewed, is like a fresh mountain breeze. The taste is balanced between sweet, floral and something else that probably differs with each persons palate. The second infusion can be better than the first with a few seconds added and a few degrees added to the water temperature. Just not my favorite, and it did not hold up very well to multible infusions. Nice artichoke/asparagas flavor. Full and smooth. A nice green tea with more than just that regular grassy flavor. Quickly becoming one of my favorites. The leaves are absolutely beautiful and downy soft (and you can brew them easily 3 or more times). The bright golden liquor and grassy, floral fragrance are pitch perfect, as is its taste. Altogether a great tea.